Broomhill Manor is a luxury complex of self catering cottages near Bude in Cornwall. There’s an extensive range of child friendly facilities including indoor and outdoor swimming pools, a games room, tennis courts and horse riding, and for the parents there’s a gym, sauna, jacuzzi and babysitting service. Broomhill Manor is located within a stone’s throw of the popular seaside resort of Bude – ideal for those wishing to walk, swim, surf, sail, fish or cycle – and which also benefits from a number of family friendly pubs and cafes, plus an indoor swimming pool and ten-pin bowling centre. The area has numerous large sandy beaches including Summerleaze, Crooklets, Northcott Mouth and Sandymouth. A short drive will also take you to beautiful villages such as Clovelly, Port Isaac and Boscastle, and other popular tourist attractions including the National Maritime Museum at Falmouth, Lands End, St Ives, the Tate Art gallery and the Eden Project are all also easily accessible. The Broomhill Manor complex features eighteen luxury self-catering properties – one apartment and the rest cottages – set in the north Cornish countryside near the popular seaside town of Bude. The cottages are decorated in a fresh, modern style and are well equipped and furnished; they are also arranged around a series of small courtyards which creates a pleasing village-like atmosphere without cars or other vehicles for parents to worry about. A holiday for a family of four during the peak summer season will cost from £1550 upwards, but prices fall to around £500 out of season. Broomhill Manor is overflowing with child friendly activities to keep kids of all ages entertained! There’s a ton of open space in the complex’s extensive grounds, perfect for kicking a ball around or generally letting off steam (though parents will wish to be aware of the large fish ponds). There are two swimming pools – one indoor and one outdoor – both of which are heated. The outdoor pool is only open during summer months, like most similar ones elsewhere, but the indoor pool is available every day of the year until 10pm. There’s a games room with table tennis, pool table and table football, and there’s also a separate under 6’s playroom with toys suitable for that age range. Broomhill Manor also benefits from a tennis court (with adult and children’s rackets available to borrow) and there are several outdoor play areas within the grounds including swings, climbing frames, slides, sand pit and wendy houses. As if that wasn’t enough, there’s horse riding available on site (for an additional charge) and you’re also within a mile of the nearest beach, which is walkable in about 25 minutes. As noted above there’s a wealth of entertainment on site to keep children happy, which in our experience at Parent Friendly Stays is the best way of guaranteeing an enjoyable stay for the parents too! But there are also a few specific features at Broomhill Manor to put a smile on mum and dad’s faces. Some of the cottages (check before you book) have enclosed gardens perfect for toddlers or families travelling with a dog, and the entire complex is set back a mile from the nearest main road. All the properties come equipped with baby and toddler equipment including stair gates, bed rails and black-out blinds. Some of the cottages have private hot tubs for a perfect wind-down at the end of a busy day, and there are also shared jacuzzi and sauna facilities at the swimming pool area. You can also arrange treatments with a qualified beautician. For fitness fanatics there’s an on-site gym with treadmill, rowing machine and cross-trainer, and there’s free WiFi available throughout the site. Always a popular feature, there’s a fully CRB-checked babysitting service if you fancy trying out one of Bude’s many pubs or restaurants, and – a rare treat – there’s also a residents-only bar on site open from 6pm each day featuring a pool table, juke box and entertainment centre. We also really like the fact that during summer months croissants or pain au chocolats can be ordered from reception and there’s also an in-cottage dining service providing freshly-cooked meals direct to your door. 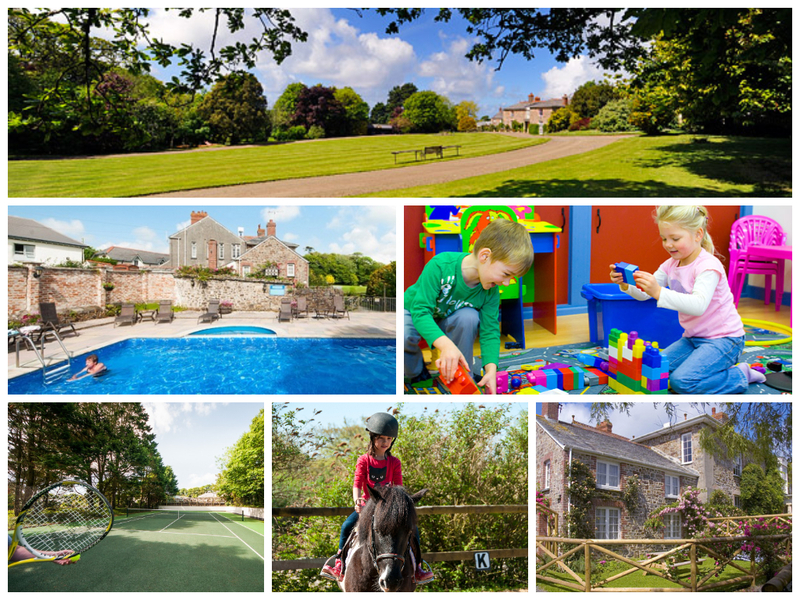 “Broomhill Manor is ideally suited to provide a balance between a holiday that the kids will love, within an environment that gives you a break also. If you’d like to find out more about family friendly holidays at Broomhill Manor, including booking and availability enquiries, just fill out the form below.